Open contracting expands across Europe, from the southern edges of Messina in Sicily to Finland in the far north, Georgia in the East, and Portugal in the West. I have probably talked to a thousand people last year, crisscrossing the continent, and all of them with one purpose: transforming the biggest market in the region. But also exploring the very concrete process, such as constructing a new courthouse in Messina. Open contracting has taken hold in unlikely places – Ukraine’s powerful transformation of public contracting has now spread to Moldova, one of the newest countries to adopt more open public procurement practices. In 2018, the European Union entered the picture as well. While it has been mostly in the spotlight for the General Data Protection Regulation (GDPR), I remember frantically renewing newsletter subscriptions on May 25, we’ve seen notable progress in open contracting. In the European Union, common procurement directives encourage open competition. Member states need to publish information about the opportunities and awards of public contracts valued over €144,000. The reporting and publication are centralized through the EU Publications Office and made available through the Tenders Electronic Daily (TED) portal. The quality and completeness of TED data vary significantly. Businesses like the OpenOpps project have improved the usability for business looking for opportunities, using the Open Contracting Data Standard (OCDS) to standardize and aggregate tender notices from around the world. The EU Commission has taken note and embarked on a project to improve the standardization and validation of the procurement notice forms (moving much closer to OCDS in the process and enabling an easier mapping and conversion process between the two formats). At OCP, we have developed OCDS Extensions to facilitate these goals. The new EU procurement notice forms are expected to come into effect in 2019 and hopefully improve the quality and completeness of opportunity and award data in line with OCDS. But information is limited. Planning and post-award are not covered, neither are contracts under €144,000. 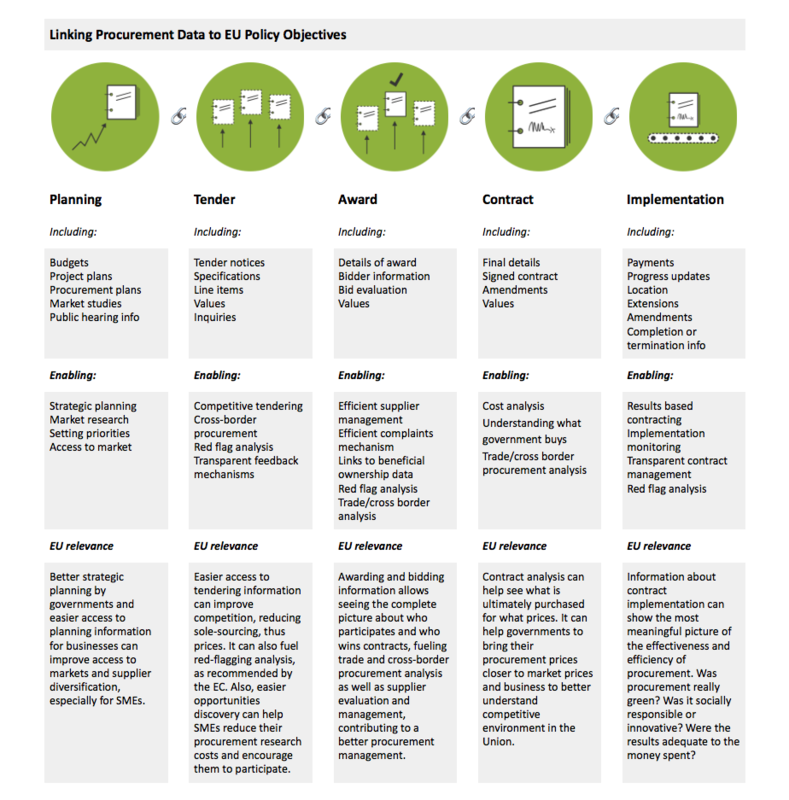 To promote accountability and an open access to the market for SMEs and strategic procurement that is green, socially responsible and innovative (as laid out in the EU Procurement Strategy and Single Market Strategy) the Commission promotes public contract registers to manage and publish procurement data from the planning stage through to implementation in one single database. In 2017, the Commission released a series of recommendations for public contract registers and created financial mechanisms to support their creation in member states. We have developed draft guidance on how the OCDS can be used to publish specific information about the planning, procurement, and implementation of public contracts relevant to the EU context and objectives, to support the implementation of contract registers. What’s going on in the EU countries? Implementation at the country level varies a lot. Digiwhist’s OpenTender.Eu has been a fantastic new resource to explore contracts across the EU, but I’d like to give a little overview of where we are at. In the UK, as of writing still part of the EU, the OCDS is being used in the contract registry called Contracts Finder. It allows users to search for information about contracts worth over GBP 10,000 with the government and its agencies, including current and upcoming opportunities. Scotland has developed an open contracting strategy and seems on track to outpace the national government as they have begun to publish data. Hansel, Finland’s central purchasing body, has launched an impressive statistics portal that displays data on public buyers, suppliers, and purchases in a user-friendly way. Slovakia’s pioneering contract register solutions have been available for around 10 years already. Slovakia is now considering new e-procurement systems and hopefully will revamp its open contracting approaches accordingly, but worth mentioning that Slovakia’s contracting system inspired other efforts to translate more procurement information into better oversight and saw new organizations become procurement watchdogs, including Transparency International Slovakia and FairPlay Alliance. In France, progress at the national level continues to move slowly, with the first sample of French OCDS data published in November 2018. We’ve also seen growing interest in an open contracting approach for the City of Paris and the Paris 2024 Olympics, including co-hosting a hackathon “challenge” with the finance director of the Olympics Organizing Committee. How about the countries that want to join the EU? To be frank, we’ve seen the most exciting progress outside of the EU, with innovation from Ukraine, especially by integrating citizen monitoring into the process through a platform called DoZorro.org. Moldova has recently launched a new electronic OCDS-based procurement system MTender based on Ukraine’s ProZorro system. While the Georgian government, one of the influences of ProZorro, has reiterated its commitment to open contracting. Serbia and Bosnia and Herzegovina are exploring the implementation of the Data Standard. Albania’s Public Procurement Commission has drafted an OCDS-based prototype of a complaint management tool and is planning to scale it over 2019. Kosovo has issued legislation mandating all government contracts to be published from September 2018, and the capital Prishtina is leading the way in implementation. We’ve been proud to work with our partners at the United Nations Development Programme and European Bank for Reconstruction and Development who are scaling their engagement in the region to support these initiatives. Our last major open contracting discussion of the year took place at the Paris Peace Forum. Coinciding with the centenary of the Armistice, it was a timely reminder of the power of an unprecedented block of countries working together to set policies to bolster peace and prosperity. It’s easy to see open contracting’s appeal in this market, which strives to break down barriers and simple rules to improve opportunities for everyone in it. The approach seems to be here to stay, providing more open and fair public contracting to ensure money spent provides value to citizens all over.